2018 Champions Trophy Hockey Highlights, India vs Pakistan: India started of their Champions Trophy campaign in style thumping arch-rivals Pakistan 4-0 in the tournament opener. Three goals in the last ten minutes helped India thrash Pakistan 4-0 in the Champions Trophy opener at Breda, Holland. Ramandeep Singh started of the proceedings for India, giving team the initial lead in the 25th minute with a clever defected strike. After Ramandeep’s opener both teams struggled to find the net in the second and third quarter. Dilpreet Singh provided India with a second goal in the 54th minute. Pakistan in an attempt to score, removed their goalkeeper and brought on an attacking player. The plan backfired for as an open Mandeep Singh’s sliding deflection earned India their third goal. Just before the final whistle Lalit’s strike in the 59th minute added glitter to the scoreline for India in the Champions Trophy opener. 19:15 IST: Thank you for joining us during our live coverage of India vs Pakistan Champions Trophy opener. Its good-bye from us for now. 19:00 IST: Full Time whistle and GOAL! Lalit finishes off in style for India. Just before the final hooter. Lalit flicks the ball into the net. India thump Pakistan 4-0 in their opening match of the Champions Trophy 2018. 57' GOAL! @mandeepsingh995 makes no mistake in sliding the ball into an empty goal to finish off a co-ordinated counter-attack by India. 18:49 IST: Brilliant tackle from Tasawar. Saves a goal for his team. 18:48 IST: Just under 10 minutes to go! India still lead 1-0 against Pakistan. 18:44 IST: Indians on the charge now! Brilliant passing from Harmanpreet Singh and Sardar Singh but Pakistan defenders deny them a goal. 18:42 IST: Fourth quarter begins! 18:37 IST: First penalty corner for Pakistan. 18:33 IST: Great long pass into the circle but Mandeep Singh loses the ball. India really in an attacking mode now, trying to extend their lead. 18:30 IST: Great pass from Rizwan but Ajaz misses again. Pakistan still looking for their opening goal. 18:27 IST: Great opportunity for Ajaz Ahmed and Pakistan, MISSES! Good positioning by goal-keeper Sreejesh to deny Pakistan a goal. 18:24 IST: Really good referral by India. Ali Shah and Pakistan denied a goal! India 1-0 Pakistan. 18:22 IST: 3rd quarter begins! 18:06 IST: GOAL! 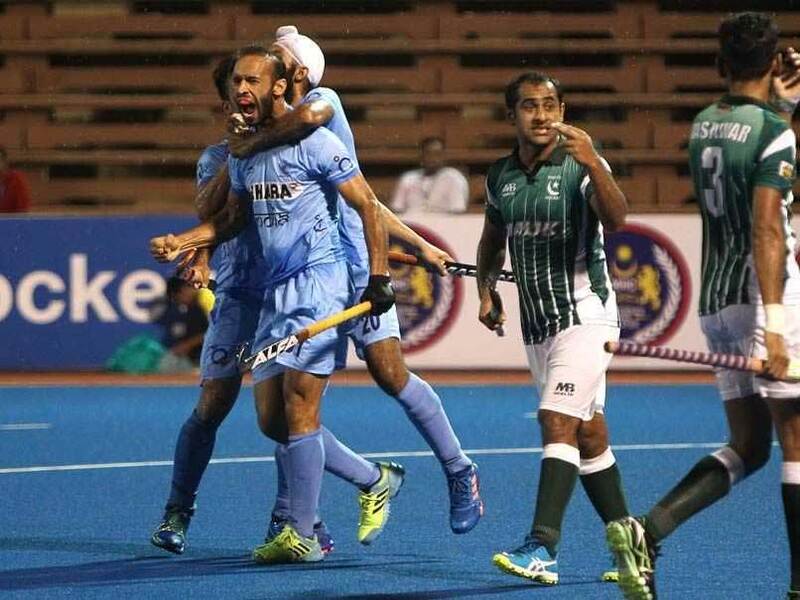 Ramandeep Singh with a brilliant deflection and India open their account against Pakistan. India 1-0 Pakistan. Just under 5 minutes to go for second quarter. 25' GOAL! @ramandeep_31 gracefully guides Simranjeet's sideways shot into the goal for India's first of the tournament and this game! 18:01 IST: Pakistan attacking more from the right side of the pitch but are getting blocked by Indian defenders. 18:01 IST: Ajaz with a brilliant run but Sardar Singh comes to the rescue. Both teams still goalless. 17:59 IST: Good work by Dilpreet Singh inside Pakistan's half but India MISSES again. 17:57 IST: Good counter-attack from Pakistan after India misses penalty corner. Indian defense restricts Pakistan again. 17:56 IST: Second penalty corner for India. 17:53 IST: Hooter goes up! First quarter is over. Both teams still goalless but it has been a really exciting match so far. 17:52 IST: Harmanpreet Singh swings hard! Cleared by Pakistan goalkeeper. 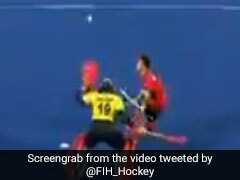 17:51 IST: Mandeep earns first penalty corner for India. 17:50 IST: Deflection from Ramandeep Singh, MISSES! . Long corner for India. 17:48 IST: Five minutes to go in the first quarter. Both teams still searching for their first goal. 17:44 IST: India playing more of a passing game currently. Dominating ball possession. 17:43 IST: Long corner for Pakistan. Cleared! 17:41 IST: Pakistan under pressure here. Brilliant mid-field passing from the men in blue. 17:40 IST: Brilliant run from SV Sunil but blocked by Pakistan defense. 17:39 IST: Pakistan looking aggressive in the opening quarter. Twice they have breached the Indian half in the opening minutes. 17:37 IST: Whistle from the umpire and here we go! 17:34 IST: We are all-set! Just minutes to go for the whistle. 17:33 IST: Both teams are at the center. Players have lined-up alongside match officials for the national anthems. 17:20 IST: Just 10 minutes to go for the iconic opening clash of Champions Trophy 2018. 17:00 IST: Playing XI for the Indian team announced. 16:50 IST: Fact: The last encounter between the two teams was during the XXI Commonwealth Games 2018 where Pakistan held India to a draw. 16:45 IST: We are just 45 minutes away from the blockbuster opening encounter of the tournament. Are you ready to watch them compete? 16:30 IST: Hello and Welcome to the live updates of the Champions Trophy match between India and arch-rivals Pakistan. Over the past year, India had enjoyed convincing victories over their nemesis right from the Asian Champions Trophy in 2016 when they had beaten Pakistan in the final. This was followed by a double victory in the Hockey World League semi-final in London 2017 and the Asia Cup in Dhaka where India lifted the title after 10 years. But at the recent XXI Commonwealth Games, Pakistan held India to a draw. 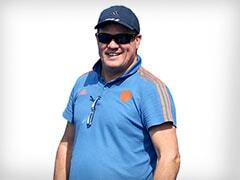 Chief Coach Harendra Singh, who took over the post recently, put things in perspective. "Getting off to a winning start is vital because it sets the momentum for the rest of the tournament. There will be no room for emotions when we take on Pakistan. 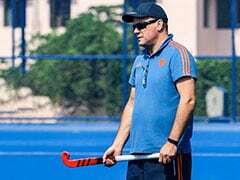 The team will play against them like any other team where we go for the three points," Hockey India quoted him as saying.